Hosung Choi is a refreshing unique change from the modern cookie cutter Tour players. And, the current Internet sensation is now more than just a good bit. 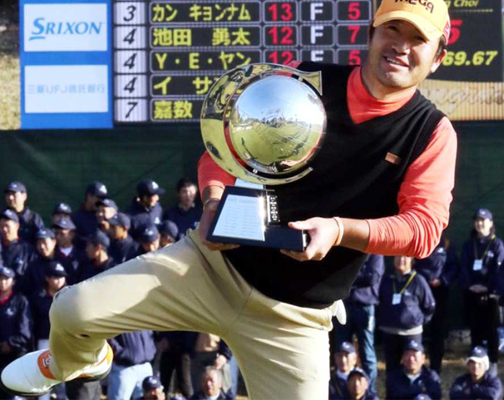 The 45-year-old is a bonafide pro winner when he won the Japan Golf Tour’s Casio World Open by one shot over Brendan Jones. If you’re not familiar with Choi’s crazy swing follow throughs, check it out below. It will make your day. Golf.com’s Josh Berhow reports on our sport’s most surprising winner. Choi has come a long way. He didn’t start playing golf until he got a part-time job at an upscale club outside of Seoul in his mid-20s. Alan Bastable has the details on the Choi’s long struggle to unlikely prominence. Hosung’s family had little money. When he wasn’t in school, he worked in the field and on the sea with his father, who was a farmer and fisherman. During a visit to a tuna factory in his senior year in high school Hosung lost the tip of his right thumb in a freak chainsaw accident. He went on to work jobs in construction and mining. He delivered groceries. Just as the tide had knocked him about, so too did life. At 26, Hosung landed a part-time gig at Anyang Country Club, an upscale golf club about an hour’s drive south of Seoul. He did not play golf but he was intrigued by the game. His tenure began in the harsh depths of winter but that didn’t stop Hosung from beating balls in his downtime, his hands blistering and bleeding in the frigid air. Choi is definitely a breath of fresh air in our homogenized pastime. And he shows that you can play excellent golf without trying to copy everyone else’s swing.